This data set contains the boundaries for the Sub Local Health Integration Network (SubLHIN) (Version 9.0 Boundary) in Ontario. The main roles of Ontario's fourteen Local Health Integration Networks (LHIN) are to plan, fund and integrate health care services locally. As part of the LHIN's mandate, there is often a need to analyse and present information at finer scales. As a result, all LHINs have defined smaller geographic areas within their boundaries. Although the naming convention varies between LHINs, in this product these regions are referred to as "SubLHIN planning areas" or, more compactly, as "subLHINs". The external boundaries of the province's LHINs are embedded in legislation and have remained stable since 2006. In contrast, subLHINs are defined by the individual LHINs for their own analytical and planning purposes. SubLHIN geographic definitions vary substantially between LHINs and are subject to change because of the needs of indivdual LHINs. In 2007, subLHIN boundaries were assembled for the province by the Health System Intelligence Project (HSIP) from definitions provided by the LHINs. In April, 2008, with the cessation of HSIP, the Health Analytics Branch (HAB) of the Ministry of Health and Long-Term Care took over the maintenance of the provincial subLHIN boundary file. 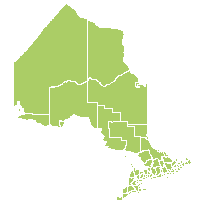 Updates to the subLHIN boundaries were passive and new versions of the boundary file were created only when a LHIN approached HAB with new geographic definitions. Beginning with Version 9.0 of the subLHIN boundaries, the MOHLTC consulted all LHINs to design and establish each LHINs planning areas. Version 9.0 reflects substantial change in the subLHIN boundaries compared to version 8.0. The most fundamental change is that three LHINs (Champlain, Hamilton Niagara Haldimand Brant (HNHB) and Central East) have requested two subLHIN levels. In this documentation and in all other material relating to subLHINs (including boundary files and crosswalks) these levels are referred to as Primary and Secondary. Primary subLHINs are the 'highest' level of subLHIN geography and encompass larger areas, while secondary subLHINs are more detailed and, in all three LHINs where secondary subLHINs have been defined, nest inside of the larger primary subLHINs. Where possible the secondary subLHINs should used as the default subLHINs, with the primary reserved for conditions where data are unavailable or not stable using the secondary definitions. For mapping and planning purposes. Caveats: All geographic locations were geocoded by postal codes or street addresses, as supplied. The geocoding process used the Statistics Canadas Postal Code Conversion File (PCCF) and the Ontario Road Network (ORN) data. Some locations were approximate to the physical locations due to the fact that the postal codes or street addresses could not be matched to the PCCF or ORN. This data was collected from best and available sources at the time of development, and may become outdated over time. This data may not contain all health service provider locations. MOHLTC continues to improve and enhance the dataset on an ongoing basis.